I was playing with colors again – spring colors, this time. The snow outside my door might have had something to do with that – it’s not even Christmas yet and I’m thinking about spring. But hey, the colors are pretty! 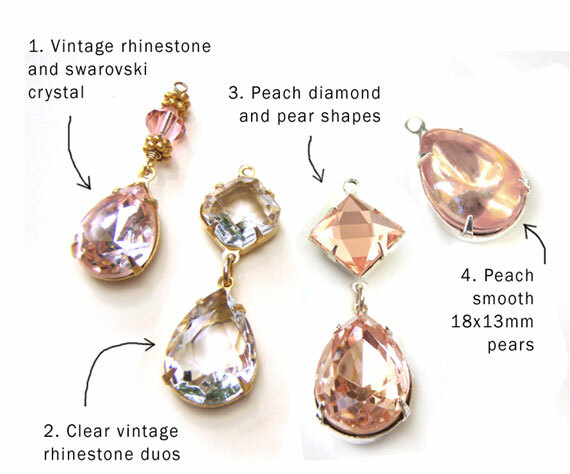 The pic just shows a few examples of how to make pretty earrings (or pendants) – easy to do and they really are lovely. Complex, intricate designs are great of course – but when you want to make something now – and have it ready tonight? This is the way to go! These leaf spray connectors are a good example of the fun things you can add to your jewelry to make it just a little more interesting! I show them here with glass teardrop jewels that are about 3/4″ high – so you can get an idea of the real size. 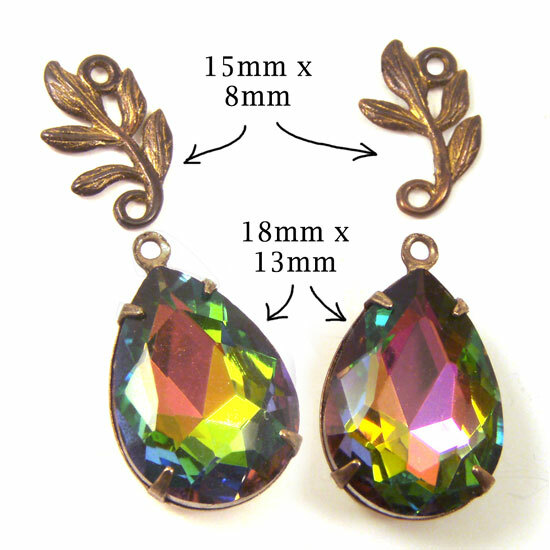 They’re small but not tiny – they could be used as earring dangles (as suggested here) or as necklace or bracelet connectors. I played with some more combinations of my “work bench bead soup” – where I grab items off my work bench and combine them, just to see how the colors look together. I thought these looked pretty good! 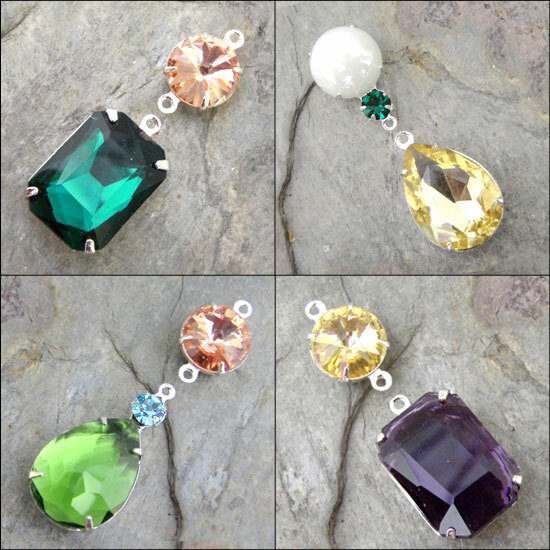 These aren’t always colors that are used together – peach, aqua and green, or daffodil (jonquil) yellow and deep purple amethyst. But the colors work, don’t you think? I don’t even need to say anything. LOOK at these shoes. This is why we buy vintage. 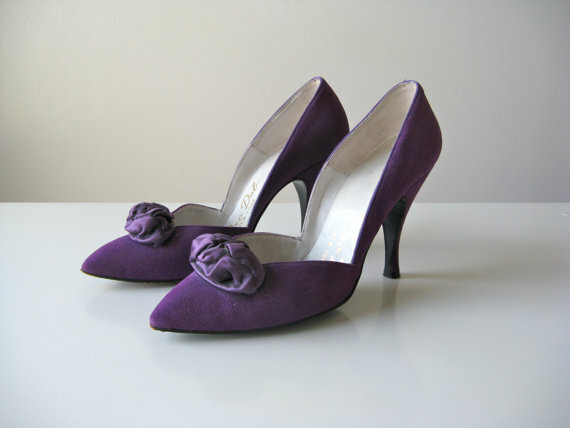 You’re not going to go into the Mall and find these shoes. Or the adorable boutique uptown. These are unique, gorgeous, and (very likely) one of a kind. They are even affordable! I found them at Dronning Vintage on Etsy and I have to tell you, there are some stunning finds in this shop. Fabulous. The owner, Catie, has a magical eye. She knows how to display her items – and give you all the visual information you need for an informed purchase. This is a valuable gift! I have bookmarked this shop. You will too. WIN. And now for something a little different – I’ve been playing with patinas lately, and I’m pretty happy with this verdigris (blue-green patina). These are bronze over steel, not brass – which means they’re thinner and lighter in weight than brass would be (but still sturdy). 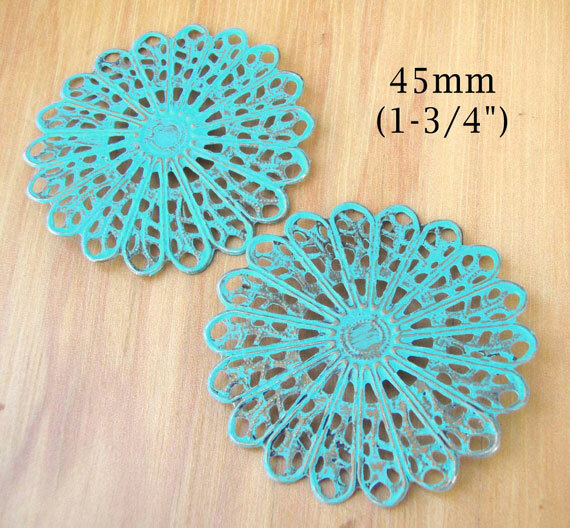 And these are big – about 45mm in diameter, or 1-3/4″. Even at that size, they’re lightweight enough to be comfy earrings. Use them as is – or add complementary jewels – I’m going to try a few designs and revisit these later this week. And you know the color – this gorgeous teal blue-green – is like the most flattering shade ever. Year round – flattering – comfy – these are a win!